Remarkable questions from a clause about zombies disrupting deliveries to There’s Something About Mary. The Picture Round is on American Imports and the Wild Card Question is all about adding up Andrew Agassi’s continual ranking? Q06. Which (internet) retailer made the news in early 2016 by inserting a zombie clause in its terms and conditions to cover against the possibility of not being able to deliver on time because of “a widespread viral infection that causes human corpses to reanimate and seek to consume living human flesh”? Q17. Which indie rock band has had top ten UK albums with Silent Alarm, A Weekend In The City and Four? Q25. In what team sport do women from the USA and Europe compete for the Solheim Cup? Q34. Which actress played Mary in the 1998 Film There’s Something About Mary? 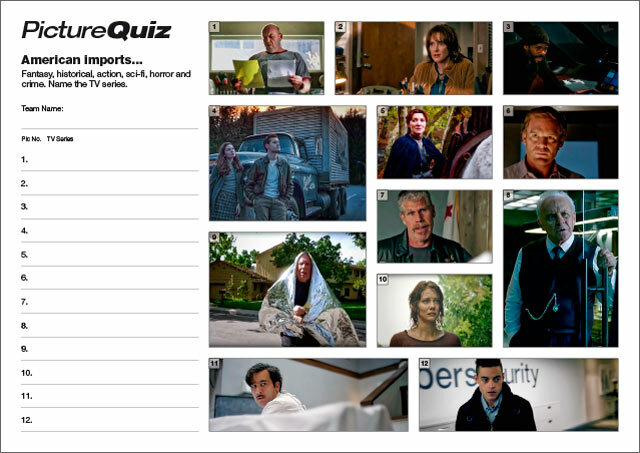 Here’s a low-res sample of the American Imports Picture Round, click for a higher resolution version. The Picture Round download is a two page high quality PDF with the answers on page 2. Quiz 064s Picture Round is can you name the American Import TV Shows? The Wild Card Question for Quiz 064 is a longevity stat about Andrew Agassi’s all time ranking?